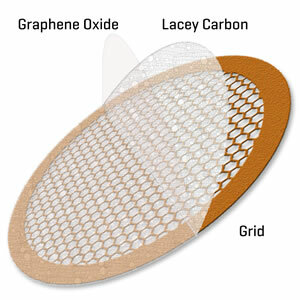 Graphene Oxide (GO) support film is a super thin (<1nm), naturally hydrophilic layer placed over the Holey, Lacey or Quantifoil support film on copper or gold grids. Pre-treatment of GO Support Films is unnecessary - by default, the hydrophilic surface spreads particles evenly across the grid. A hydrophobic surface can be achieved by heating in the air. Note: plasma cleaning or glow discharge will damage the support film.